“Dirty electricity” is a rather unscientific term used loosely to describe a signal waveform that has extraneous noise components riding on top of it – typically of higher frequencies and/or a transient random nature. The controversy is whether or not this phenomena has any measurable impact on human health and safety. Please notice that the use of the terms “dirty” and “electropollution” have a negative connotation and will tend to immediately bias any reader. Also, the term “dirty electricity” and “electropollution” are not the same. Dirty electricity is any electromagnetic waveform that has unwanted and / or noticeable harmonics and regular or intermittent transients in either the voltage and / or the current component. Electropollution is another relatively unscientific term used by certain EMF consultants / specialists to describe potentially any and all electromagnetic waves of artificial origin, so dirty electricity is only a small subset of EMFs that could be included in the meaning of electropollution. Bear in mind that there are a number of natural sources of electromagnetic noise such as the Schumann resonances, (spectral peaks in the Earth’s natural ELF field) and radio atmospheric signals which are known as “whistlers” and “sferics” (or also spelled “spherics”) which are produced by global lightning strikes that interact with the ionosphere and Earth’s magnetosphere. Now before you think that I am completely dismissing the topic out of hand, I can tell you as an electrical engineering graduate that extraneous noise usually is a real problem, but it is normally far more so to equipment (particularly sensitive electronics) directly powered by it rather than to human health. I do have equipment designed to track this down, but this applies more to the commercial arena where (for example) anomalous equipment operation can be caused by a nearby defective (or poorly filtered) LED bulb or an arcing motor in some other part of the building. Most power supplies are designed to filter out and/or minimize the potential damage that these noise spikes and transients can do before they reach the vulnerable logic components of your computer or charging cell phone. In addition, surge suppressors and UPS (uninterruptible power supplies) are an inline solution to prevent some of the larger transients such as those from a nearby lightning strike from doing something unpleasant such as zapping the motherboard of your PC. They are also designed to filter out noise that may corrupt data such as on an Internet LAN cable or in critical medical and scientific equipment such as an EKG monitor or scanning electron microscope. But on occasion due to ground loops or incompatible equipment grouping, even the best power supplies can be thwarted if the data/signal lines themselves have corrupted information and / or spurious noise. In this case, you are looking for what is known as S/N or the signal to noise ratio. So what about the effects to human beings? Does the electric noise on your 60 Hz AC mains actually cause any health problems? I find it unlikely for several reasons. 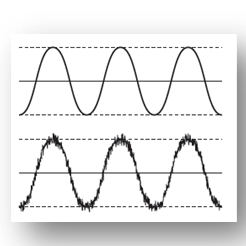 For one, the overall amplitude of the noise is typically much lower than that of the 120 V AC already on the lines – usually by an one to two orders of magnitude. (at least 10 – 100 times less) Then assuming you are not directly connected to the line (which would be a far more dangerous and immediate problem than any alleged long term health effects) you have to consider the electric near field that is present near any energized line with voltage. The electric field “couples” or induces voltages in the human body with very poor energy transfer because the very high dielectric constant of water present in the body shields the internal tissues, cells and organs. The resulting induced internal voltages and current in the body from external fields are reduced by an order of 1,000,000 times less. So even with an external electric field of 1000 Volts / per meter (V/m) the induced voltages inside a human would be on the order of 0.010 V/m (10 milliVolts) or less. This is much less than the typical voltages generated within the heart and brain which are from 1 – 10 V/m. Furthermore, the endogenous DC fields generated by the flow of ionic current through cells in the body is on the order of 10 – 100 V/m. I find it hard to believe that a 10 milliVolt field could substantially perturb a system that routinely generates voltages that are 100 – 10000 times greater. Again, this is within a 1 KILOVOLT / per meter electric field which is much higher than you will see anywhere except inside of an industrial electric room or underneath a high tension line. The electric field generated by the alleged dirty electricity has a greatly diminished amplitude – probably no more than 10 V/m. Divide that by the same attenuating factor of 10^6 (1 million) and you wind up with induced voltages of 0.0001 V/m which is in the microvolt range. (100 microVolts) This is even more unlikely to cause any noticeable change inside the human body given the fact that the resting membrane potentials of most human cells range range from -40 to -80 millivolts which is at least 400 X to 800 X greater than the 100 microVolts cited. The negative numbers for the internal voltages of cells are stated as such because you are measuring the voltage with respect to the ECF (Extracellular Fluid) surrounding cells which is used as a ground reference. And again, this is in a 1 kiloVolt / meter field. What you encounter routinely inside of a home is at most 100 V / meter or so, and more typically 1-10 V /m. So divide that 100 microVolts by 10, 100, and 1000 and you wind up with 0.1 – 10 uV (microVolts) being induced in the body which is hardly a drop in the bucket as far as electrochemical signaling in the body is concerned. There is probably a greater pathological effect from listening to Barney The Dinosaur than this minuscule amount of “dirty energy” injected into a human host. Even if there are minor effects, the body is an organism with a renowned impetus and ability to maintain equilibrium under a range of conditions. This is why we usually don’t perish as soon as something affects our blood pH, body temperature, glucose levels, etc. Our bodies are constantly keeping up with an influx of stress, bad food, bacteria, substandard air and food quality and a plethora of other threats and chemical / genotoxic insults. We only become ill when a substantial imbalance develops that our system cannot compensate adequately for. In addition, many of us already have DSL for high speed Internet access which runs routinely pulses high frequency signals through telephone lines and yet I never hear any fuss or concern expressed over this medium. Granted, the practice of using twisted pair conductors does prevent this “noise” from radiating any appreciable distance, but it is in the high frequency ranges that many claim are damaging when present on a power line. I find it interesting that certain so called “experts” seem to cherry pick what type of noise is clean or dirty. At any rate, I do not claim that electromagnetic energy is COMPLETELY harmless, only that it is better to calmly examine actual data and put said risks into proper perspective. This is your friendly Dallas / Fort Worth / Houston / Austin EMF Testing Inspector signing off for now. This entry was posted in EMF Protection, EMF Testing Bio-Electromagnetic Health & Safety Levels, Sensitive Electronic Equipment EMI (Electromagnetic Interference) Grounding and "Dirty Electricity" and tagged Austin, Baubiologie, building biology, Dallas, Dirty electricity, electropollution, filters, Fort Worth, high frequency noise, Houston, power grounding on May 24, 2013 by jagman777. While the LED itself has a long MTBF (Mean Time Between Failure) the weak point in LED bulbs is the AC/DC converter circuitry. In the 7 LEDs I have bought so far in the past 4 years, I have had 3 failures. One of them actually failed in less than a month which is atrociously worse than virtually any incandescent I have ever owned. Another one had a flicker problem which developed in just over a year (I just replaced that one this month) and another burned up a regulator IC after a few years use. The inrush current and transients when you turn on an LED light can destroy cheap components over time just like any other bulb. I have found the ones with ribbed cooling fins to work better, but it is hit and miss as to which manufacturer and model you should get as there is enough variation between manufacturing runs due to corners getting cut without warning. LED lighting – just like SSD (Solid State Drives) it promises to be a huge leap in reliability but a manufacturer always seems to figure out a way to pinch pennies and wreck that longevity gap. (some SSDs used to have just as high or an higher a failure rate than conventional hard drives until the manufacturers got their failure modes worked out. Don’t get me wrong – I like LED lighting and have been converting over for years, but be careful in your research. Bear in mind that the biggest jump in energy efficiency was from incandescents to CFLs, (a factor of 4) but from CFLs to LEDs the jump is not quite as dramatic. (a factor of 2) Also, the weak link in any LED bulb is the AC/DC converter built inside – ribbed heat sinks help a lot and I don’t think it hurts to look for Energy Star rated bulbs. Otherwise, you can wind up with an LED bulb that does not even have nearly the longevity of an incandescent. I have seen it too many times. From my experience, the Cree models sold at Home Depot are pretty decent and the ratings I see on there look promising. Just hang on to your receipt and look at the color temperature in Kelvin (not the same as actual temperature) so that you can “color match” your lights. From 2700 – 3200 K has a yellow cast with the “hotter” temperatures like 4500 K and up looking more and more bluish white. Cooling ribs on the side promote longer life. I prefer incandescents for the bathroom, but the higher temps for task lighting and elsewhere. If you have a mismatched set in a ceiling fan for instance, it will be pretty obvious. From an EMF standpoint, the lower current draw of an LED is attractive as that also lowers the magnetic field intensity. However, there is more potential noise induced in the electrical wiring which can cause unexpected problems and anomalies with other electronic equipment. This entry was posted in Acoustic Sound Surveys and Lighting Level Measurements - OSHA Safety ADA ATM Applications, EMF Protection, Sensitive Electronic Equipment EMI (Electromagnetic Interference) Grounding and "Dirty Electricity" and tagged CFL lighting, EMI sources, LED lighting on June 13, 2016 by jagman777. Sometimes I am dismayed by the lack of what I consider to be “common sense” science knowledge and critical thinking skills displayed by not only the mainstream public, but also by supposedly educated individuals. Even some experienced medical doctors I have personally met display an alarmingly poor understanding of even basic physics and draw conclusions that range from dubious to plain ridiculous. While I have enormous admiration for anyone who achieves a doctorate degree, particularly in the health sciences field. and I am not detracting from their actual medical skills and experience which I know well outweighs my ability in that arena, the intersection of how physical forces and energies interact with the human body exceeds a knowledge of anatomy, experience with disease and how to perform surgery. As a recent example, I was watching an episode of Dr. House which is a medical mystery drama series loosely based on the character of Sherlock Holmes, but set in our modern 21st Century. I am a huge fan as I enjoy the acerbic wit, sharp dialog, medical jargon, dark human dynamics and brilliant acting which is fairly consistent throughout the show’s history. I am well aware that the series takes a very liberal Hollywood treatment of distorting facts to fit a story better, but given that there was a legitimate episode which involved accidental radiation poisoning, I found this on the edge of inexcusable. The kind of radiation that a Geiger counter detects has nothing to do with the electromagnetic fields found in any kind of modern home appliance, even a microwave. Geiger counters typically detect Alpha radiation if the detector itself has a mica window, (high energy Helium nuclei) Beta Radiation, (high energy electrons) Gamma Radiation, (high energy photons) and in some cases X-Rays depending on the model. The energy levels of EMF and RF even well up into the microwave and thermal infrared range simply do not have enough energy to ionize atoms and thus set off such a detector. 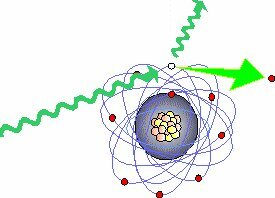 And by the way, thermal radiation causes molecules to vibrate more rapidly, which is a very different effect than knocking subatomic particles (such as electrons) off of an atom. Most people do not understand the electromagnetic spectrum, the difference in physics and physical effects that different regimes of frequency manifest and will often confuse one with another. Visible light is a form of electromagnetic radiation, but it is not the same thing as X-Rays or gamma radiation. This lack of understanding can lead to a fear of things which have no demonstrable effect on the human body, and I have clients purchase instruments or shielding gear that is not designed for the concern they have. More than once I have seen a customer purchase an RF meter (instead of an EMF meter) to measure power lines and vice-versa. Or the meters are of insufficient consistency, quality or display their information in a confusing or misleading manner such as labeling different readings by color code (green, yellow and red) which have no real world correlation to any particular standard. This is why consultant services such as ScanTech exists – not simply to read numbers on a meter, but to supply context and meaning to what exactly is being measured and what risk factors / effects are associated with that. This entry was posted in EMF Meters, EMF Protection, EMF Testing Bio-Electromagnetic Health & Safety Levels, RF Testing Cell Phones Smart Meters Weak Tower Reception and tagged emf, EMF meter, false, incorrect, myths, Radiation, safety levels on November 23, 2014 by jagman777. DNA can be damaged in many different ways through a variety of mechanisms, many of them from exogenous (external) causes, and some from endogenous (internal) factors. On average, this damage tallies out to 10,000 to over 1,000,000 molecular lesions per cell per day in the human body. 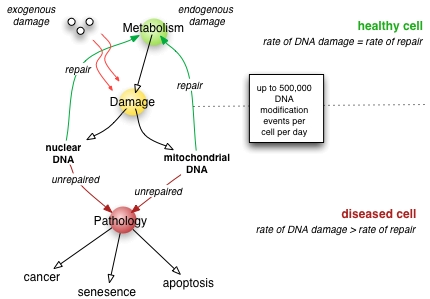 Fortunately, most of this damage is either automatically repaired on the DNA itself or the damage can set off a global response to prevent reproduction of the mutated/damaged cell. But occasionally the body’s systems do not catch the error in time (or the damage is repaired incorrectly) and the cell is allowed to multiply into a tumor – either benign or malignant cancer. 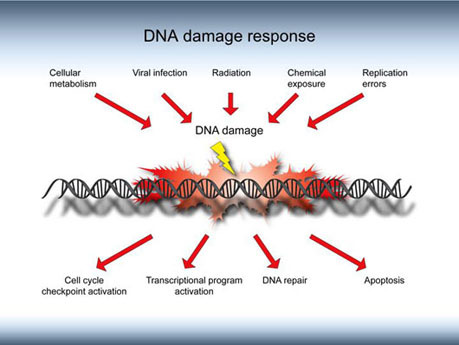 The forms of DNA damage can be classified by agent and the effect on the DNA strand itself. 1) UV radiation from the sun which is technically a form of EMF, but it is electromagnetic radiation that is at a high enough frequency / energy level that it is crosses over into the ionizing radiation regime. UV-A radiation can lead to the formation of free radicals which cause indirect damage. UV-B radiation can crosslink adjacent thymine and cytosine bases and create thymine or pyrimidine dimers, which is known as direct damage. 7) Some studies show or suggest evidence of damage from certain Electromagnetic Fields (EMFs) including both low frequency power lines and higher frequency RF (Radio Frequencies) including those in the microwave range which are used in cell phone / tower communication. 1) Attack by Reactive Oxygen Species (ROS) or Reactive Nitrogen Species (RNS) generated in the course of normal bodily functions which can form hydrogen peroxide and ammonia respectively. (both are toxic) The presence of these compounds come from oxidative deamination which form oxoacids in the liver. Point Mutation – A mutation that alters a single nitrogenous base. It can be either the substitution of one base for another, or the deletion / addition of a single base or small number of bases. Base Substitution Mutation – The substitution of one base pair for another in DNA. Because of the degenerate nature of the genetic code, base substitution may or may not alter the amino acid encoded. If the new codon from the base substitution still results in the same intended amino acid, then the mutation is considered “silent”. But if it results in a different amino acid being produced, then it is termed a “missense mutation” as the sense (bio-genetic intelligibility) of the codon produced after transcription of the mutant gene is altered. There are two categories: Transitions and Transversions. A transistion does not change the type of bases in the base pair as in a pyrimidine vs. a purine, but a transversion does. A variety of human genetic disorders (such as sickle cell anemia) are caused by base substitutions. Nonsense Mutations – A special category of base substitution arises when a base is converted in such a way that the transcribed codon is converted to a stop codon. This stop codon results in premature termination of the translation and leads to a truncated (incomplete) protein. Frameshift Defects – The addition or deletion of a single base has much more profound consquences than does the substitution of one base for another. Frameshift mutations alter the reading frame in the mRNA (messenger RNA) downstream of the mutation, which in turn will mean the majority of the protein will be altered. Frameshifts can also cause the same effect as Nonsense Mutations as 3 in 64 codons are stop codons which means there is a relatively high probability the protein coding will be prematurely stopped at the wrong point. This entry was posted in EMF Protection, EMF Testing Bio-Electromagnetic Health & Safety Levels, Medical Illness Environmental Home Testing, Radon Gas & Safety Testing - Dallas / Ft. Worth and tagged cancer, cellular dna, emf, emfs, leukemia, radiation damage on August 3, 2014 by jagman777. This is a list of the various conditions whose risk factors are believed to be correlated to EMFs (electromagnetic fields) from power lines, cell towers, cell phones, smart meters, microwaves and other electrical/electronic devices. This is not a confirmation or affirmation that any of these are necessarily true or to suggest hard safety level limits; but it is part of the continuing blog and educational journey of determining the true causation and effect relation. Where applicable, I have put abbreviations and/or descriptions of these conditions as they traditionally appear in research literature for convenient reference to coming articles on the epidemiology of possibly EMF related diseases and conditions. Also the risk factors they are allegedly linked to are listed as well. In the developed world, about 50% of all adult men and roughly 33% of all adult women develop cancer during their lifetime. Cancer is generally described as an unwanted / unregulated growth of cells with malignancies having a potential to metastasize and invade other organ systems and tissues. Cancer types are organized by organ and cell type they originate from and by the morphological characteristics of the cancer cells themselves. 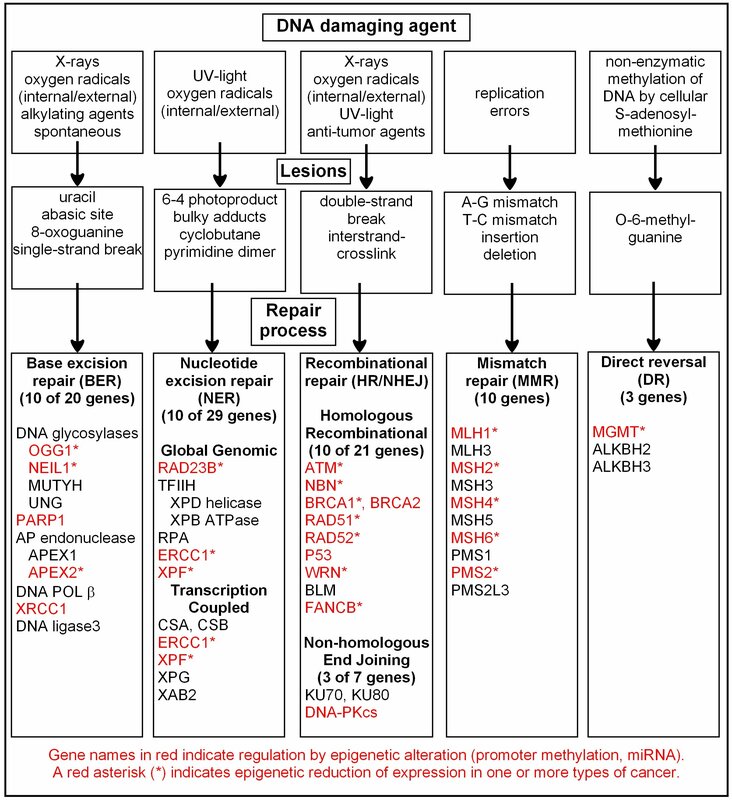 Carcinogenesis is a multi-stage process which may include genetic (alteration of DNA composition and structure) and epigenetic (alteration in gene expression without DNA alteration) changes. It is suggested that external stimulus such as certain types and levels of EMF/RF may contribute to the multi-stage cancer process by influencing epigenetic changes resulting in effects such as abnormal cell proliferation and differentiation, apoptosis or modified adaptive responses. Leukemogenic factors are agents which are or believed to be related to promoting the development of leukemia. Childhood Leukemia (CL) – Power lines (rates are 4.5 per 100,000 developed world and 2.7 per 100,000 in developing countries) CL is a family of biologically heterogeneous neoplasms and represents the most common cancer in children with 30-50 new cases per million children developing worldwide annually. 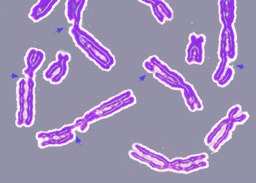 Acute Myeloid Leukemia (AML) – Represents 15 % of all cases and incidence rises with increasing age and has few causative agents, but include benzene, alkylator, topoisomerase II inhibitors and ionizing radiation (which includes radon gas in up to 13% – 25% of all cases estimated worldwide) which is of a wavelength far beyond that of power lines. In general from birth, the incidence of leukemia rises to a peak of around 3 years of age, then declining briefly before steadily rising throughout life. This is unlike most cancers as it has a peak incidence early in life and a short latency. Acute Lymphocytic Leukemia – Limited evidence of benzene related exposure causality. Multiple Myeloma – Limited evidence of benzene related exposure causality. Non-Hodgkin Lymphoma – Limited evidence of benzene related exposure causality. Glioma (a malignant form of brain cancer) – Allegedly linked to cell phones as it has a short latency and is fast growing. Meningioma (a diverse set of tumors in the meninges of the brain; usually benign) – Allegedly linked to cell phones though the Interphone study shows reverse causality. This entry was posted in EMF Protection, EMF Testing Bio-Electromagnetic Health & Safety Levels, Medical Illness Environmental Home Testing, RF Testing Cell Phones Smart Meters Weak Tower Reception and tagged ALS, Alzheimer's, brain, breast, cancer, Childhood Leukemia, dementia, emf, emfs, Glioma, Parkinson's, power lines, RF on December 26, 2014 by jagman777. Epidemiology, or the study of disease patterns as they relate to a particular health hazard or set of potentially harmful hazards as applied to a range of biological effects, is a complex field in it’s own right. When studying the epidemiology of EMF & RF fields as they apply to the incidence of childhood leukemia, brain cancer, Alzheimer’s and other dread conditions, it becomes even more complicated and controversial for a variety of reasons. As a part of my ongoing consulting research with regard to the health impact of power lines and EMF, I continue studying epidemiology, biology, medical geology, probability and statistics in conjunction with and in the context of my electrical / biomedical engineering education and considerable technical experience in order to structure and ask the relevant questions to this topic. So why is it so difficult to get a straight answer about whether EMF or RF radiation is harmful? And why can no one agree upon a set of EMF safety levels? 1) EMF and RF does not come in one simple flavor or dose like a known chemical or ionizing carcinogen / hazardous material does. For instance, benzene is a scientifically acknowledged carcinogen whose effects have been well studied, documented and most of all REPRODUCIBLE. Benzene comes in only one form, one structural formula of C6H6 with an aromatic ring structure. The amount presented to a test subject is a simple measure of volume vs. the mass of the test subject. Not so for EMF as it can present at a variety of frequencies, waveform shapes, amplitudes and time weighted exposure levels. It is easy to feed a lab rat 1 gram of benzene a day to see the effects. You can subject it to an ionizing UV light at a specific frequency for a given amount of time. But because of the constant electromagnetic fluctuations that a human is subjected to in suburban / urban activities throughout a daily routine, you do not have a firm control over the independent EMF variable like you would with benzene or UV light. It is essentially inhumane and technically impractical to keep a single person, let alone a number of control subjects substantial enough to warrant a valid study on EMF effects in a completely homogeneous magnetic or RF field for the length of time required to see any possible effects. A “zero EMF exposure” control group with which to compare to an “exposed group” virtually does not exist in our culture. So how do you make a true comparison between groups as in a valid epidemiological study? As one famous epidemiologist once pointed out, if everyone smoked, then lung cancer would be considered a genetic disease, not an environmental one. 3) Time lag between exposure and actual disease manifestation. 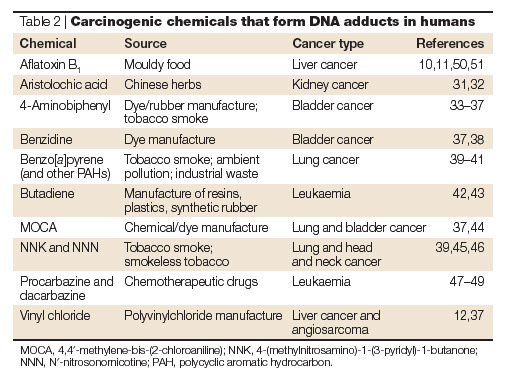 Even with some carcinogenic habits like tobacco smoking, years or even decades can elapse between the event and any serious health effects depending on what you smoke, how often and genetic predispositions. How do you keep a person in a uniform 1, 5 or 10 milliGauss field for that length of time? The cost involved would be enormous and it would essentially be a prison. Then you have to look at diet, the quality of air and water, and the probable lack of exercise given the confined space this would dictate. So a true epidemiological study in the strictest tradition is virtually out of the question. 4) Even if you do see some apparent effect, how do you know it is the EMF and now some other agent that is responsible? Correlation is not causation, so if there is a true link between the electromagnetic fields from power lines and cancer, it is important to identify and understand the actual metabolic pathways and mechanisms by which this operates. What if areas of greater EMF exposure happen to correlate with higher urban density? (which tends to be true as a higher population density also means that more electricity / current is used which will tend to produce higher magnetic fields) But is it the magnetic fields that are responsible, or the stress, pollution and other factors that come with inner city living? 5) And let’s say there is a correlation between exposure to EMF and RF fields and some health effects; (which I suspect there is at least something to it) at what level and for how long is this necessary for it to even be apparent within your lifetime? How does it compare with other risk factors that you might be more susceptible to? I am not here to minimize concerns, but I will point out that there are a lot of environmental factors to consider when it comes to health (radon gas or indoor air quality for instance) and you should prioritize them in order of which is most likely to affect you. 6) It is a politically charged subject. If exposure to EMF is indeed a major health issue, then this opens utility and power companies up to litigation which is impractical for the normal functioning of our modernized society. For what it is worth, they will never admit if it is a problem or not and for understandable reasons. They are in the power generation business, and they already have a lot of policies, procedures and regulations regarding the safe production and distribution of electricity. Electricity is potentially dangerous to their employees and customers, so they already have plenty to worry about in terms of conducted power, let alone radiated fields. Also, their strength is in power engineering and infrastructure, not playing doctor, or being bio-electromagnetic experts. And for those who say the power and utility companies try to hide the truth about the effects of EMF to protect their bottom line, I will point to the opposite side of the spectrum where there are individuals who make a living by scamming and scaring the crap out of people by inventing / exaggerating concerns, amplifying fear and then selling some solution or gadget which does nothing but drain your wallets. The reason I consider this dangerous is because the misdirection of attention and distorting risk has the potential to create tunnel vision, and leaves people open to being blindsided by the real and present dangers that already exist. Also, there are some electropollution extremists that have such ridiculously stringent standards for protection from EMF levels that they would essentially insist on society living in the dark ages without the electrical and communications infrastructure that contributes in many ways to our comfort and safety. What about the importance of lighting, 911 access, air conditioning and modern research and medical facilities? Or is the very real and measurable mortality rate of populations who live in 3rd World conditions where infectious disease and lack of potable water cause widespread death, shortened lifespans and a high infant / child mortality rate more desirable? A large part of the problem is the lack of understanding about how electricity and electromagnetism works along with incomplete knowledge about basic biological processes. Even modern biophysics does not have all of the answers about DNA replication, protein synthesis, etc. so this is not a criticism, just the fact that most people do not or cannot invest the time necessary to learn about these subjects (and keep up with current research) in enough detail enough to make an informed opinion / decision. But I do, and my education is forever continuous because I believe in the right of a client to be able to have access to enough information to make a decision they can live with comfortably. Also, I want to get to the truth myself as I find the subject matter fascinating, and it leads me along a valuable process of discovery. I hope these postings help to dispel the mythologies and ignorance which pervades the subjects of how our environment can or could influence the function of the human body. What people typically know about electricity is that it is everywhere, the effects of lighting and powering motors can be seen, and it is absolutely lethal or dangerous if you do contact a sufficient voltage / amperage to stop your heart or cause other bodily harm. Everyone knows that you should not climb a transmission tower and touch a wire, so there is already a built in fear or at least respect for what a sufficient amount of electrical power can do to your body. This association I feel is responsible for why so many people have a primal response which varies from uneasy to negative when observing an imposing 238 kilo-Volt primary feeder with tall metal towers looming over their backyard. This entry was posted in EMF Protection, EMF Testing Bio-Electromagnetic Health & Safety Levels, Medical Illness Environmental Home Testing, RF Testing Cell Phones Smart Meters Weak Tower Reception, Smart Meters - Safety Level Risks to Health and Cancer and tagged cancer, emf, emf protection, EMF safety levels, epidemiology, high voltage powerlines, power lines, RF, risk on June 3, 2014 by jagman777. I feel the answer is both and in the middle of the extremes, but there are secondary effects that many people do not consider. For one, excessive stress of any kind is a proven killer, so if someone has a perception strong enough that a transmission tower or their smart meter is physically damaging them, the connection between the emotion and the chemicals generated in your body as well as the resulting metabolic changes tend to make it a self-fulfilling prophecy. For example, cortisol is a hormone released by stress that also depresses the immune system. If you are chronically worried about something, your health is likelier to be impacted in a negative fashion. Also hypertension (high blood pressure) is definitively linked to stress and has been long denoted as the “silent killer”. Then there is the distraction factor; it is well known that those under extreme and / or prolonged stress are likelier to experience illnesses or accidents. This is not saying that it is simply: “All in your head.” This diminishes concern to fantasy or delusion, whereas the physiological effects are real and can be empirically measured, regardless of the direct effects of the high voltage tower or cell phone repeater. And what goes on in your head is very important as it directs your attitude, mood and where your attention is at a given moment. Also, you should take into account the indirect dangers of our radiation emitting technology that have nothing to do with the EMF or RF itself. Consider the distraction of a cell phone while driving, or the sedation of sitting on the couch watching hour after hour of TV. How about spending hours a day on Facebook without having genuine face to face human interaction? It doesn’t take a genius to see where I am going with this. Look at how it can potentially skew epidemiological studies. There is a factor called “confounders” which can mislead the directions of cause and effect. Are you aware that the original epidemiological study in 1979 by Ed Leeper and Nancy Wertheimer which suggested a link between childhood leukemia and high power lines did NOT actually involve EMF measurements? They simply drew conclusions based on “cancer clusters” and the diameter of the wire used to distribute electricity using the reasoning that a thicker wire carries more current and therefore the magnetic field is higher. Knowing the actual physics of EMF reveals that this is a reckless and scientifically ignorant manner in which to gauge a potential cancer causing metric as there are many other factors which affect the actual net magnetic field as discussed in one of my previous posts. Poor critical thinking skills such as this is akin to linking the condition of a street sign with local crime. The sign itself does not have a direct bearing, but the social and demographic factors that the sign exists in may also give rise to conditions that affect crime rates. Perhaps it escaped the original researchers that a higher density power lines also means you are closer to high population densities where you also have more traffic causing pollution, increased noise levels which can induce stress, industrial centers potentially releasing toxic chemicals into the air and so forth. When you choose about where to live and what the risks are, you need to think holistically if you want to get an approximation of what falls into your acceptable definition of “safe”. Humans are predictive beings, but they are historically poor at realistic risk assessment. People worry about getting murdered or crashing in a plane when they are far more likely to die in a fall at home. So they buy a gun, or refuse to fly, but then try to paint on a roof while standing on the top step of a ladder which has a clear warning label. This entry was posted in EMF Protection, EMF Testing Bio-Electromagnetic Health & Safety Levels, Medical Illness Environmental Home Testing, RF Testing Cell Phones Smart Meters Weak Tower Reception, Smart Meters - Safety Level Risks to Health and Cancer and tagged Cell Phones, Computers, emf, Health risks, Internet, RF, safety, Wireless on January 2, 2015 by jagman777. The reason I did not put a range is because there is no such thing as a hard, rigid number as to what is safe or unsafe because there are so many factors involved. If I told you that 3 milliGauss (mG) is the safe limit, that implies that 2.97 mG is perfectly fine and 3.04 mG is dangerous which would not be a true statement. While I believe EMF fields have an effect on the human body, it is fairly weak in typical fields found in everyday life because the human body compensates for a variety of conditions in a continuous process called homeostasis. Also by focusing too much on the magnetic fields you will have a tendency to overlook more established and dangerous conditions such as radon gas, poor indoor air quality, antibiotic resistant bacteria, mold, mosquito and tick borne viruses and diseases, etc. EMF fields do not behave like chemicals which have fairly well established dosages and exposure levels set by government agencies and scientists such as LD50 (Lethal Dose 50 %) or STEL. (Short Term Exposure Level) There are variables such as frequency, peak levels, time of exposure and susceptibility of the individual which is based on genetics, immune system function and so on. What I do is survey a property and compare it to other places that I measure and look more at orders of magnitude rather than a 1-2 milliGauss difference. Do you know what the level of the fields are in the place you live in now? Are you aware of what are typical and ordinary values of magnetic fields in other suburban (or urban) homes in the area? Many homes I have surveyed in the certain urban areas have average interior values of 5 – 8 mG (due to increased power density and decreased utility easement distances) and there are a few homes where I have found 10 – 35 mG. Standing or driving beneath a high power line will have a value of anywhere from 2 – 290 mG so the difference between 1 mG in a home and 2 mG in a home is relatively small in the context and scale of how much fields can and do vary. In deciding what house to live in, you can spend a lot of time and effort trying to find a place that has a lower level like 0.3 mG – 0.5 mG (which is very close to as low as you can get without having electricity at all) but that does not really mean that the home is safer overall to live in for the reasons and risk factors I mentioned above. There are some environmental factors where a slight change is very noticeable and important to comfort such as temperature – some people find 69 F to be comfortable, but others prefer 72 F. On a planet where temperatures range from below 0 degrees to over 100, that is very small (a few percent difference) but important. EMF fields are not like that as at the 1 – 2 mG level for example, there is hardly any range left to decrease to 0.0 mG as you are already close to the bottom in what is known as ALARA. (As Low As Reasonably Achievable) Even though 2 mG is 100 % higher than 1 mG and may seem like a large increase, the health risk levels do not behave in a LINEAR fashion as you might find with known toxins. At the worst, it is better to view EMF levels on more of a logarithmic scale (powers of 10) rather than integer multiples. But in respect to your request I will give you some ranges that in my opinion are fine for where people spend 90 % of their time or more, but I have to emphasize the most of the time part because I do not feel it is beneficial for people to be scared if for a fraction of the time (for instance, even 20 hours a week) the magnetic field exceeds these numbers. Also EMF meters do not always agree with each other because of design and frequency weighting. Finally, the stress of worrying about EMF causes more damage on average than the EMF field itself as stress itself is a proven health hazard. If you are afraid, children pick up on those emotions and it definitely impacts them. It is good to be concerned and make informed decisions, but I caution people against letting fear overtake common sense and practicality. And with that thought in mind, one of the unifying concepts I have observed in working with thousands of clients is if they are concerned enough to pay to have an EMF survey because they care that much about their family, they are already doing a lot of the right things to protect themselves and those they love. This entry was posted in EMF Protection, EMF Testing Bio-Electromagnetic Health & Safety Levels, Indoor Air Quality (IAQ) Testing Dallas - Fort Worth - Austin - Houston, Radon Gas & Safety Testing - Dallas / Ft. Worth and tagged average, EMF safety levels, homes, power lines, residential on March 12, 2016 by jagman777. An understandable query, but the answer may surprise you. EMF consulting is a specialty field that most of my clientele have very little familiarity with and it is wise to try and ascertain if you are getting good data for the money paid. However, my extensive technical experience covering over 25 years in several interdisciplinary fields (including experience and certification in the calibration of instrumentation) has given me a rather unique perspective and stance about the relevance of this question. My short answer is that as long as it is a digital meter of semi-professional grade or better from a reputable company and is in proper working order from the date of purchase, observing calibration intervals (which are usually a holdover from the old analog days) is not as important as some may think PROVIDED that the meter is known to be initially accurate within a certain % depending on the application. Very often, you can perform a cross-check with other meters and as long as they are in close agreement, that indicates proper operation. The particular meter/model is known to have serious accuracy / unpredictable performance issues such as one model I discuss on this site. Damage from impact, fluid intrusion or a corroded battery has or is suspected to have caused operational issues to the sensors / internal electronics. 1) Unless you are doing actual research grade work, (such as in academia or R&D) are calibrating other instruments, or you are performing mission critical work (such as an infusion pump dispensing medication to a patient in a hospital) you simply don’t need the absolute best accuracy to accomplish the mission of the instrument. Close is good enough for almost any application of EMF surveying. For instance, if an EMF meter reads 1 milliGauss, (mG) but the true NIST traceable reading is 0.9 or 1.1, being off by 0.1 mG or 10 % should not be the deciding factor between buying a home or not. 2) Readings of magnetic fields, radon and RF naturally fluctuate over time, so what is more important is looking at an average. 3) Different meters have different frequency weightings so no two meters will be in complete agreement anyway. 4) You cannot always trust a calibration sticker. A dirty secret in the industry is that a lot of money is spent on calibrations that are incorrectly performed or not even done at all. I know this as a fact because I have not only had calibration technicians tell me, but I was IN the instrument / radio calibration business myself. Just because an official looking piece of paper says that a meter is accurate, you are still trusting the honesty of the person / company that certifies the equipment and often there is not a clear “chain of custody” that holds anyone responsible or that the right / qualified individual actually performed said calibration. I am not saying calibration isn’t worth doing, nor am I accusing any calibration company in particular, just that you should maintain a healthy amount of wariness about this issue. A controversial subject analogous to this is the autograph authenticity industry – try Googling that and I believe you will find some of the stories very eye-opening and sobering as to the real value of an expert’s opinion when volume vs. quality directly impacts the bottom line. And frankly, it is easy to forge a very official looking calibration certification paper for most instruments. For example, received and transmitted RF power is notoriously difficult to nail down due to reflections, constructive / destructive interference, etc. so that getting within 3 dB (or 50 % accuracy) is considered reasonably good and the reading can change depending on your antenna gain, frequency weighting or just moving the instrument a few centimeters to one side. In plasma physics, if your measurements are within a factor of 2 of calculated values, that is considered valid. In other words if you expected to get 5 and get 8 instead, (a 50% + error) that is still in the acceptable ballpark of even high level research data. 6) Calibration at annual intervals is an old and in my professional opinion for most instruments, unnecessary “feel good” tradition that no longer matches the actual requirements of modern solid state electronics that have a fair degree of drift compensation and stability compared to older, analog devices. If you have a new instrument made from a reputable manufacturer and after only a year it is found to be significantly off, then I would strongly suspect it was defective / improperly calibrated to begin with. And this is not just my opinion; a number of modern instruments now manufactured have recommended calibration intervals that are either upwards of 10 years + or are even guaranteed for the life of the instrument barring serious damage such as that from a fall / water immersion, etc. which would probably place the meter in a category of “inoperable and uneconomical to repair” so it would be replaced with a new one anyway. This entry was posted in EMF Meters, EMF Testing Bio-Electromagnetic Health & Safety Levels and tagged AC gaussmeter, calibrated, calibration, certified, electromagnetic fields, emf, EMF meter, meter, safety on March 2, 2014 by jagman777.